Building Safety Month (BSM), founded by the ICC, is celebrated by jurisdictions worldwide during the month of May. Building Safety Month is a public awareness campaign to help individuals, families and businesses understand what it takes to create safe and sustainable structures. The campaign reinforces the need for adoption of modern, model building codes, a strong and efficient system of code enforcement and a well-trained, professional workforce to maintain the system. The campaign is presented by the ICC and its 57,000 members worldwide along with a diverse partnership of professionals from the building construction, design and safety community. Corporations, government agencies, professional associations, nonprofits and more come together to support Building Safety Month because they understand the need for safe and sustainable structures where we live, work and play. This year's theme is Resilient Communities Start with Building Codes. Each week of Building Safety Month spotlights a specific area of building safety. For the last 35 years the 50,000 worldwide Members of the ICC have celebrated advances in constructing safe, sustainable, affordable and resilient buildings and homes. The ongoing support of Building Safety Month and the important role code officials play in public safety in the built environment comes from the President of the United States, governors, mayors, county executives and other government officials and construction industry professionals. The Building Safety Month campaign helps to improve public safety by increasing awareness about how building codes and code officials improve and protect the places where we live, learn, work, worship and play. Building Safety Month depends on the efforts of individuals like you. ICC will provide several resources to assist you in promoting Building Safety Month in your community. These resources will include strategies on how to set up a Building Safety Month event, a fill-in news release, a sample proclamation, kid's activity pages, stickers, brochures, pencils and more. Many resources will be available for free download and others may be purchased from the ICC Store in the near future. 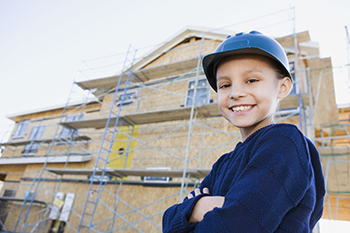 Consider these tips to Promote Building Safety Month in your community. Promote BSM through your Chapter activities. Set up an information booth at city hall or a local hardware store. Visit a school and give a presentation about building safety. Post local information on your website. Send a news release to newspapers, and radio and television stations. Encourage local media to cover Building Safety Month activities and send public service announcements to local radio and television stations. Public information officers, city managers, or mayors could also arrange to appear on a talk/community information show through your local television or radio stations. Include a call-in, question-and-answer session as part of the program to generate even more interest. Be sure to also invite your local media to any scheduled events you plan during the month and post on your social media websites. All communities need building codes to protect their citizens from disasters like fires, weather-related events and structural collapse. Model building codes are society's best way of protecting homes, offices, schools, manufacturing facilities, stores and entertainment venues. Code officials work day in and day out to keep the public safe. Building Safety Month is a month-long celebration of all aspects of building safety that helps families, employers and leaders understand and appreciate the best practices that keep the places where we live, work and play, safe.